I PREVIOUSLY WROTE:I will not be accepting any new network ads on CMF. After my calculations from yesterday at Just Throw Money, I have decided that it is just plain unfair to those who have paid a full 15 cents a month to advertise here. Instead of their ads being shared among 3-6 others, they are now shared among 12 others, giving them much less exposure time. I have already accepted the initial wave of ads, but I won't be accepting any more. UPDATE 2/3/10: The CMF staff have addressed this concern by limiting network ads to 30% of the views on any blog. Given this response, I will now accept any network ads that I feel are appropriate. 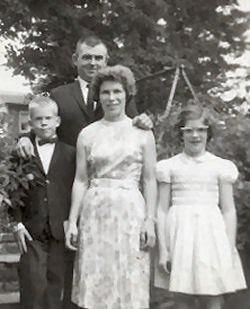 Wow, isn't it funny how dated pictures seem after half a century? I should enter this in one of Lin's dork-off contests. But, at the time this seemed like a lovely family picture. So, now that we've had a chuckle over the fashions, let me tell you that these people are some of the most important of my childhood. This is the pastor of my church from the time I was 10 until when I was 15, and his family. His name is Rev. Edward Black. He had been a missionary in Haiti and told many stories of his experiences there. He and Melissa were much more than pastor and wife to me. They probably are the reason that I survived a very confusing childhood, so I naturally developed a real interest in the things which interested them. Then I met Marie, my hiking buddy and still best friend, the summer that we were 12. She had an aunt who was a nun, who was also a missionary in Haiti. That all seemed so strange to Protestant me that it was very memorable when I met Aunt Agnes (formally known as Sister Tarcissia) and discovered that she was a very real and wonderful person. In fact, this wonderful lady just died last year at age 96, very active until her final year. If I can become like anyone as I age, I choose Aunt Agnes. But in high school, she only deepened my interest in Haiti. The summer following our senior year in high school, both Marie and I were selected to attend the Girl Scout Senior Roundup in Idaho. I was heartbroken that we were put in different patrols, and Marie was sick the whole time, leaving her rather oblivious! Her patrol was an international patrol, an extra honor. This meant that two Scouts/ Guides from a country other than the United States joined that patrol for the two weeks of Roundup. Guess, where those Scouts were from. Yup, Haiti! Here they are. 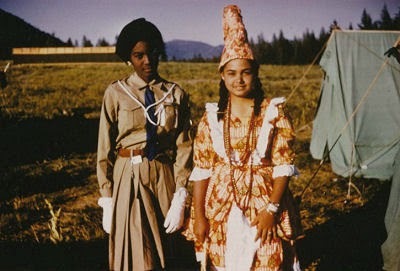 Marie-Bernadette is wearing the Girl Guide uniform, and Mirielle is modeling a native costume. Because they were in the other patrol, I never got to know them very well, but it just increased my interest in the country. I know that they were from Port-au-Prince. With what I know now, my guess is that they must have been from well-to-do families. All of this early interest lay rather dormant for a long time. Then the four boys from Haiti came to Ludington in the spring of 1984. I showed you their pictures on Jan 25. When we learned that Mission Possible, working with Project Serve was putting together the trip that I ultimately went on, I was very interested. But we had no money. We were working in ministry ourselves, and always behind on being paid. I never even thought for a minute that I would be able to go. And then this lady, Ella Mae MacDonald (seen here squinting in the Haitian sun), called me on the phone. She had been a long-time supporter of the organization that we worked for, and personal friend as well. She wanted to go on the trip, and she wanted to pay my way so that I could go too. Wow, again! Needless to say, I was thrilled. Praise the Lord, and pass me a suitcase! I managed to convince my family that they could live without me for a week... no mean feat at that time of my life, and off I went on the adventure that you have been reading about for several days. Tomorrow the post will be somewhat painfully personal. I will tell you what I learned about myself on that trip. It was obviously an experience that I have always cherished, and am SO thankful for. But I really didn't have a very good week. Come back tomorrow if you are brave, and find out why. This is going to be a slipshod plant tour. In 1985 my interest in serious botanizing was just beginning. It wasn't until 1986 that I was challenged by a professor to begin learning the Latin names, and the characteristics of plant families. So all you will see are some things that caught my untrained eye. The picture above is taken from the plane as we approached Port-au-Prince. We were told that it was mostly sugar cane fields. Here is a cottage at the resort where we stayed the first three nights. This is the tourist Haiti, and there is a little bit of that along the coast. It was a mid-range tropical paradise postcard setting. There was an outdoor bar, restaurant, pool, and as you can see palm trees waving above thatched roof cottages. The lower plants with large leaves are banana, and I don't know what the darker green shrub is. Also at this resort were hibiscus in bloom. Here is a banana tree in blossom (the big pink pendulum), and the bunch of bananas growing along the branch above the flower. Although almost every conservatory in the US (I think I've seen one at all the ones I've visited), seems to have a banana tree, it was pretty cool to see one just growing outside. I'm sure that my worldwide blogging friends from warmer climates won't think that this is odd at all! I would be happy for any input on these from worldwide friends! I believe that the large pink flowers are some morning glory or a cousin. I have no idea what the darker pink ones are. I'm repeating a picture from yesterday. The flowers planted along the fence are Cana lily and castor bean. These don't seem exotic at all, since many gardeners, even as far north as I am, plant these. The Cana lilies must be taken up every winter and the castor bean is an annual anyway. There is also a shrub there with smaller red-pink flowers. I don't know what that is. This is my favorite! And I'm not sure of the identification. Frankly, it looks like a dead tree with pom-poms tied on. The closeup of the blossom is below. That leads me to believe that it is a mimosa. Yet, any mimosa I've seen had leaves when it was blooming. So, again, if anyone actually knows what this is, I'd be glad for the info! Tomorrow, I'll tell you why I've had an interest in Haiti for so many years. Today I'll start with just a reminder or two about the decades of ecological devastation in Haiti. This is another picture from the airplane (see first one on Jan 23). Because there is just a small area with trees down there, you can see by contrast how bare the hills/mountains are. The highest mountain is just about 30 miles SE of Port-au-Prince, Pic la Selle. At 8,793 feet, it really is a mountain, and consider that the coast is, of course, at sea level, and you begin to get a feel for how quickly the land rises once you get away from the coast. The hills are barren because, initially, they were stripped of their mahogany forests. However, now, they never have a chance to regrow anything, because as soon as any tree is large enough to be cut to make charcoal it is cut by one of the 9.8 million people who need to cook their meals. This is a long view of the river where the people were doing laundry (see Jan 26). This shows just how barren the banks of the river are. You can see some greenery trying to gain a foothold, but it just can't complete with the footfalls of the masses. I don't mean to belittle the Haitian people, but there just isn't much motivation or knowledge available for people to change the way they live. When a family has lived in abject poverty for several generations, any societal memory of how to live differently is pretty much gone. However, if you recall, on Jan 26, I did talk about the small village of Frettas that was on a river, and was raising crops. I admire their industriousness, but have to wonder if the practice of tilling every available inch of ground was going to/ did lead to wearing out the poor soil. This is a field of beans. In contrast, the next pictures were all taken at the Baptist Haiti Mission in the hills (4350 feet at Fermathe) above Port-au-Prince. This mission has been working there since 1943, and their motto is "Growing in service to the whole man." One of their long-term goals has been to teach people how to nurse the land back to health, and thus nurture themselves. This first began with teaching women to embroider items to sell to tourists, and has grown from there. These greenhouses, and even flowers along the fence, are part of the project at BHM to teach people how to reclaim the land. It's a real example of the familiar but true axiom: "Give a man a fish and feed him for one day; teach a man to fish and feed him for a lifetime." Here is where many of those seedlings ended up. The hillsides are being terraced and planted with crops, and trees. Good farming practices to keep the soil healthy are being taught. I would hope that other organizations have been working to help people learn this too, but it was such a contrast with the rest of what we saw all week, that it was really refreshing! The mission was also trying to reintroduce some farm animals for meat and teach people how to raise them. Here is a pig. There used to be many pigs in Haiti, but a cholera epidemic (1899 – 1923) wiped out every pig on the island. It is a difficult task for an entire culture to change. I am hopeful that even though the thousands of students at all these different schools are only a drop in the bucket of Haiti's 5 million people under the age of 20, that some of them will be leaders for change to help the Haitians reclaim their country and their dignity. OK, I could do three more posts. You tell me how much more you want to hear. I can do: 1. A small selection of trees and flowers, mostly from nicer areas of Port-au-Prince, 2. The reasons why I have had a lifelong interest in Haiti, 3. What I learned about myself through this trip (this would be scary to write, but it's no big secret). Here is this month's contest. This is a "classic" vocabulary quiz. I have learned the first five words in the past couple of months from books or puzzles. Questions 5-10 are more like a puzzle. There is one word in that group that I just learned today, but the rest are pretty ordinary words! Figure out two words that fit each set of definitions, the words will be exactly the same except for changing one letter. Email me your answers (jhy@t-one.net) before midnight EST, January 31. In case of a tie, the earliest completely correct entry wins. Hey, SIL Loretta is here for a few days! Who knows what we will do? That's not part of the quiz, since I have no idea what the answer will be! Everyone has heard a lot about the poverty in Haiti. Accounts are not exaggerated. I had a hard time selecting pictures for today. Some of these pictures seem to show a relative "wealth" of one village. But it is all part of a bigger picture. The two pictures above were not taken in some remote village, but right in Port-au-Prince. In fact, you can see vehicles behind the lady carrying a tray of food on her head. But very few people have a car or truck. Only the fortunate even have a donkey, such as the lady on the right. This picture is blurry, because it was taken as we drove by. This is not far outside of the city, and it is women doing laundry. It's hard to see how clothes could be much cleaner after washing when the only place to spread them to dry is back on the mud. But if is this is all you have, you make it do. I hesitate to tell this next story, but it adds a dimension of understanding. We saw a women urinating beside the road. They do not squat, but just bend the knees a bit. All the women wore dresses when I was there. She simply stopped where she was and relieved herself. I was surprised at the mechanics of the process and asked the lady from the mission if they just don't wear underpants. She said that they would prefer to, but most of the people can't get any. The next few pictures were taken on the way to, and at the village of Frettas, hidden in the mountains. Above, you can see our truck on the road. This was the road that was too rough to take the van. On the right is a river, and you can see that some greenery has grown up near the water. But the unvegetated slopes on the left are the problem. Water runs down and across the road creating huge eroded channels that have to be crossed. For one of them we all had to get out and move rocks until the truck could get through. Finally we were able to cross over to the next valley and were looking down at the village of Frettas. As you can see, it looks quite lush. And that is its wealth. Since it is on a river, the people actually are able to grow food to eat and to sell. Every inch of tillable ground was planted; the crop of choice in the season we were there was beans. Its poverty is its remote location. It was very difficult for the people to get out of their valley to sell their crops. We were quite a novelty. They were quite unused to seeing white people, and many of them just wanted to touch our skin. Of course, this also means that it was difficult for any amenities to be brought in to the village. This is so funny that you may not believe it, but you've heard of a "one horse town?" Well, this is a one donkey town. Seriously, they had one community donkey with which they could transport goods in or out. And that donkey was cared for with great concern. It was tethered here in the deep shade, to keep it as comfortable as possible on the hot day. In Frettas, as you can see on the right, there were some cement buildings, but the school here was built of palm fronds, the building on the left. With virtually no wood in the country, those are really the only choices for building materials. As you may have heard on the news, the palm buildings were much safer in the earthquake. The most appalling story has no picture. I can't believe that I didn't take one, because it certainly would have really told a story. We had just passed all these masses of people carrying a few sticks, trying to scavenge scraps of food from the garbage, washing laundry in ditches, with children who were only fed at school... then, alongside one of the dirt roads was a... vending machine? Yes, it was. I have no idea how it was powered. People were walking up to it and inserting coins. Of course I had to ask. Would you believe that it was a machine selling lottery tickets? People who would scrounge tiny chunks of wood to make charcoal, and had no food, were putting any coin they had into a machine on the chance (ha!) that they would win a pile of money. Go figure. Actually... shame on the government for that exploitation. The last picture for today, below, is pretty sad. Yesterday you saw some of the children at the TB hospital, playing. Unfortunately, there was also a whole room full of children like the one below, who probably never played again. This location got to me more than any other. There were rows of those metal cribs, all painted blue, and each with a small, dying child. Now, what I'm about to say is not disparaging of the care. You can see that this little girl is clean, and has even had her hair braided. Now, if you are young, you may just think, well... that was a long time ago, what's the big deal about a row of metal cribs. Trust me, medical facilities were way more modern than that ward, even in 1985. This looked more like something out of the 1930s. That's the tour for today. Tomorrow, we will take a break and do a little game to see who can win an ad for a month. This time it will be a word game, more like some of the early ones. The next day, we'll come back to Haiti for at least one more day. I have a little more to show you about the environment. Although this picture was taken in Haiti, we knew these four boys for several months before we traveled there. They are, from left to right: Perry, Jean-Marie, Jean-Pierre, and Duvie. These boys could speak English, French (the official language of Haiti), and Creole (the popular language). With this skill, they came from Haiti to the United States on a tour with some Mission Possible staff as ambassadors for the country and the schools. They gave a program and sang at the church and school where our son Joshua was enrolled. To keep the story short... as a result another lady from Ludington and I ended up on the trip. While we were in Haiti, the boys served as interpreters for our team most of the week. They were such engaging young men, the youngest was 9 and the oldest 11. I hope that they have grown up and been able to help their families out of the poverty they came from. Their visit to Michigan was in March, and I recall that they were cold all the time, despite being fitted with warm winter coats! The day that I helped rake the floors in houses being built (see yesterday's post) these neighborhood children were very curious, but shy. I finally coaxed them to come over and have their picture taken with me. You can see that their clothes are much poorer than those of our four friends, and you may recognize those distended bellies on the boys as signs of malnutrition. They only spoke Creole, so we didn't communicate at all except with smiles. The last picture was taken in the Port-au-Prince "Iron Market," a famous tourist trap. All the shop owners are very savvy as to tourists. Their line is "You Christian? Me Christian. I make you good deal!" It was rather overwhelming. I brought home a small carved and stained folding chess table for only $5, and two small paintings for 50 cents each! I don't have a single picture of the church service we attended. We all went to an English-language service in Port-au-Prince. But it was really awesome to be worshiping in a truly international congregation. I think I would have enjoyed it in French just as much. There were a couple of interactions that were particular to me. The day that we worked in the mountain village I was sent to the local market (not the one in the picture from two days ago, but similar) to buy lunch. I went because I did speak a little French. We could order either chicken or peanut butter sandwiches, but they said to be sure to order them on "country bread," "pain de pays," because it was baked locally. That was fun, and made me feel useful. The bread was soft with a sort of smoky flavor from being cooked over the common fuel- charcoal. My favorite interaction was mine alone. But I don't have any picture. After the day that I painted alphabets for the kindergarten and first grade rooms I was just hanging around until the van came back with the rest of the team. I'm not sure where the other lady was that had been painting. But there was a group of kids practicing a song in French after the school day had ended. I knew just enough French to talk to the teacher who was leading them after they had finished. She helped me write down the words and learn the song. Then she signed the page for me. Her name was Frantzi Charles, and her helper was Jacqueline Julat. They wanted to know my name, and we all laughed at how it sounds, because in French it is Jeanne Jeunne. Oh venez, quelle merveille, Oh venez. Quelle fete sans pareille, Oh mangez. Invite tous au festin, Oh mangez. Frantzi did tell me that the English name is "Come and Dine." I figured out the chords and used to play and sing it to myself fairly often, but over the years forgot most of the tune. However!!! I just found a midi file of the music on line (isn't the internet great?)! I had never known the English words. It's interesting to compare them with a literal translation back from the French. Anyway... if you want to hear the tune and see the original English words, it is located at the Cyberhymnal. And... you can get the music for free. You can believe that I will be printing that out and re-learning the tune. I was surprised to learn, just tonight, that it is a century-old hymn. OK, that was plenty for today. Tomorrow, we'll go back to some of the sad parts... how poor the people were. We will take a little break for the monthly contest in a couple of days. There seems to be enough interest in the Haiti story to keep it up. It makes me really happy to be able to share it with you. I've done a phone interview with Loreen Niewenhuis of Lake Trek, and wrote my newspaper column about her walk around Lake Michigan. I wrote two articles for Textbroker and one for Associated Content. I need to be doing more. 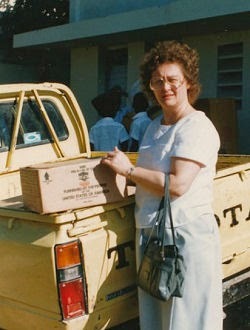 Today I'll tell you a little bit about the variety of things we helped with during our week in Haiti in 1985. As I said, we went as a support group with a medical team. There were two eye doctors, a doctor and nurse couple, and a dentist. The rest of us helped any way we could. In these pictures I'll just show some actions, tomorrow I'll share some interactions with people, although I don't have as many good pictures of that as I would like. The picture above was how we got to some of the locations. Sometimes we went in vans, but see that funny-shaped thing in the truck with the team? That is the portable dentist chair. It had to be hauled around with us, and especially the day we went into the mountains the road was too rough for the vans so we rode in the back of the truck. Some of our duties were just simple organization. Each day the "clinic" had to be set up and taken down. Sometimes there was a cement building, sometimes we were in a woven palm hut. We also did things like line up the people outside who were waiting, and "talk" with them. I speak a little French, but I'm not so great with people. The motherly-type volunteers who could convey their caring without words did much better at those tasks than I could do. Two days I was one of the people who went through the schoolrooms pre-checking kids' teeth to see whose were the worst, to send to the dentist. The doctors looked at up to 70 patients a day! I don't remember exactly what this baby's problem was, but she looks happy enough. Most of the medical problems we saw were actually minor. The clinic wasn't really equipped for emergencies or serious problems. But a lot of people came with infections, and a lot of babies and expectant moms were checked out. The dental clinic was more serious. The dentist was really frustrated, because all he had equipment and time for was extractions, so anyone with a really bad tooth had it taken out. I actually spent more time working with the eye doctors. There is apparently a way to just look in people's eyes and be able to know what prescription of glasses they need. We had 2000 pair of donated glasses with us, all labeled, but just thrown in big cardboard boxes. Now, I may not be so good with people, but I'm great at organization. After just a few hours of pawing through boxes to find the right glasses, I started sorting! Before the end of the day it was much easier to find glasses that fit that could help people see. In my journal I wrote that there were at least two people a day who left in tears because they were so happy to be able to see again. When you turn in your old glasses to the Lions club or other groups, you can be sure that they really do good for other people. I also wrote down that one day we needed a very strange prescription for an older man whose eyes were quite different from each other. The doctor doubted that we had a pair of glasses for him. But I actually found the exact prescription that he needed! One day, two of us who had some art skills stayed at one of the larger schools and painted the alphabet above the blackboards, and a colorful mural on one of the walls. One day, they asked for some volunteers to do some physical work. This was more up my alley, and, yes, that's me on the left. If you look at the floor in this building you will see that it is rough dirt and rocks. These were small houses that were being built for families. The walls were built first, and our job was to rake the dirt level and remove the worst of the rubble so that the floor could be poured. I think that each volunteer had a very different experience because of our varied tasks. If I'm feeling brave, when I finish this series I'll tell you some things that I learned about myself on that trip. Meanwhile, tomorrow, I will show you more of the people of Haiti. I'm really unsure where to begin what is going to have to be a blog series. There is no way to condense my week in the horribly poor country of Haiti into one day. Yet, I don't want this to be a book, either. Well, here we go! In 1985 I had the chance to go to Haiti on a short-term mission trip with Project Serve. They coordinated the trip with "Mission Possible" in Haiti. MP still serves Haiti and the Dominican Republic with seven schools. Our team was there for 7 days and we went to a different place every day. This is why it is very hard to condense the story into one post, but it gave us a great overview of the problems the Haitians faced, even without an earthquake. The picture above is from the airplane- our first view of the mountains of Haiti. You will notice that they look very barren. They are. That condition is not due to their great height. It is a result of the stripping of the mahogany forests decades ago. The ecosystem was completely ruined, and the forests have never regrown. It is very difficult for people to even maintain subsistence lifestyles. I'm assuming that since Haiti has been in the news so much this week that you don't need a locator map. So I'll just zoom in on the Baie du Port-au-Prince. You can see the numbers 1-7 in red. Those are all the places we worked: some city and some very remote. We acted as support for a medical team, but we had varied tasks. We flew into the airport that has been so much in the news. It is very small, what you see in the picture is what there is. We flew in on a small jet from Miami, which parked on the tarmac, and we just walked down some roll-out steps and into the airport. It is my understanding that the tower came down in the earthquake. CNN quoted a pilot this week as saying "there was somebody on a radio somewhere in the airport who is trying to help kind of coordinate the landing of planes. But it is - it's literally just somebody on a radio and no one is sure where that person is." So when there have been so many complaints about flights not being able to land, there is a very real physical limit to the number of planes that can be on the ground before they just plain run out of room. I've heard reports today that they are landing an aircraft every 12 minutes. This is pretty amazing considering that they have to be unloaded. Seriously, this space isn't as big as the parking lot of some malls. This was a typical sight that we saw almost every day. This is a marketplace. Does it look like it came from another century? (Well, technically is was... haha... I can't believe how long ago I took this trip), but this is how commerce is done pretty much everywhere outside of Port-au-Prince and a couple of other cities. We spent a day at one of the largest Mission Possible schools in Montrois. These ladies were cooking the school lunches on the charcoal burners you see. They were fixing lunch for 700 people! For most of the kids at their schools, this was the only meal they would have for the entire day. At school they also had access to clean water which was trucked in and gravity fed from a large plastic tank on the property. The children proudly wore uniforms of white shirts and blue pants or skirts. This was like a badge of accomplishment for them. It meant that their family cared enough to make sure that they could go to school. Other schools were also orphanages, where the uniforms were provided. Tomorrow I'll show you some of the tasks we did. 10:16 PM- Lily had her baby at 12:38 EST. This is definitely the big event in my day. I spent WAY too much time glued to the web cam. You might have trouble figuring out what you are seeing. Lily is sort of upside down, with her head in the lower left. The big white blotch in the lower right is just the edge of the den. In the middle of the picture is her haunch. She is lying on her right side. The smaller gray triangle is her muzzle- see her eye to the lower left of that? Here is the great part! This is when they knew they really had a cub. This is just a closeup from the picture above. Did you see it already? Look at that little arm reaching out to touch mama bear on the nose! If you look at the video (see it on You Tube), you may be amazed, as I was, at how loud that tiny bear is! Although less than a pound and smaller than a can of pop, it sounds oddly like a human baby crying. To see more about Lily, I blogged about her over at North Country Trail News. I sense from the lack of comments that many of you don't find opposite tree branches as exciting as I do. (wink) That's OK. But I think I'll take another day off from the trees and go back in history tomorrow. In 1985 I had the privilege to go to Haiti for a short-term mission trip. With encouragement from Chuck at Secondary Roads, I will tell you a little bit about that trip.